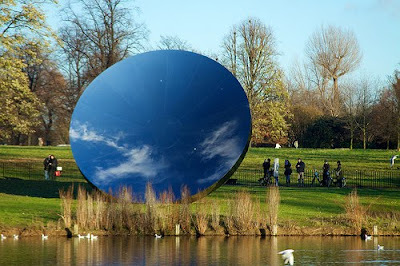 There's so much to see in this great city, that until today your author has kept forgetting to highlight Anish Kapoor's Turning the World Upside Down, which is a great piece of installation art showing in Kensington Gardens. You've probably all seen or heard about it already, but for anyone who hasn't it consists of highly reflective stainless steel mirrors, which, we are told 'create illusory distortions of the surroundings' and 'new vistas in this famous and much-loved setting'. I saw his `Cloud Gate`in Chicago last summer(they call it The Bean). Very cool and fun to look at and photograph. I wish Toronto or Waterloo would get some of his art! I enjoy your blog immensely and my list of things to do in London when next I go there is ever increasing. Thanks! Thanks Jenny, I love hearing from people abroad who are enjoying it! You most definitely have to go when it's sunny. I went on a cloudy, grey day and I'm afraid to say it was all rather rubbish. Tempted to pop back should we get nice weather on a Saturday or Sunday before March 13th!